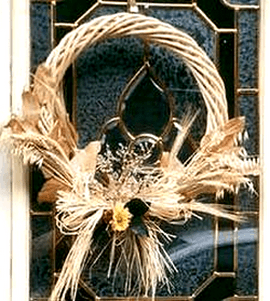 A few stalks of dried wheat, grasses and florals are all you need to make a classic fall wreath for your front door. You can easily make your own air-dried flowers, weeds and grasses. You can even make your own vine wreath base from weed vines or grapevines as the base. But, in the Fall, you can also find a wide selection of dried autumn florals in the craft stores or dollar stores for reasonable prices. Pick out a few nice bunches and set aside an hour or so for nature crafting! This wreath is really easy to make and it’s a great project for the beginner. You can use any sort of wreath you like. I like the bamboo and grapevine wreaths the best. Begin by placing your wreath flat and immediately below it, lay out your first layer to be attached. This will be your lemon leaves. I used two small branches of lemon leaves (you can use dried weeds or anything similar). One branch on each side at the bottom. Now on top of your lemon leaves, place a few strands of wheat (or any other similar dried). Now you have two layers done. Take a bunch of raffia or ribbon if you prefer and make a good size bow to fit the wreath you have chosen. There is no fancy way of making this bow, just tie a regular shoe lace bow. Place this bow on top of your other two layers. Does it look nice so far? If not, add a little more or take a little away. To finish up your design, place an odd number of single flower buds in the centre on top of your bow. Always use an odd number of flowers for this centre. If you place an even number such as two instead of three you’ll see the difference. It looks much nicer with odd numbers. Now if you are happy with how the arrangement looks, you can begin to attach it to your wreath. If not, just add a little or take a little away until you see something you like. To attach your florals, begin by moving each layer away from your pile, being careful not to disturb the actual design. For beginners, place your layers in rows, so that when you attach them, you’ll attach them in the order you intended. Starting with your lemon leaves, glue with hot glue to both sides centred at the bottom of your wreath. Refer to photo often for design. Now hot glue your next layer on top of the lemon leaves (wheat strands), one at a time, making sure each piece is secure. Now glue your ribbon to the centre bottom. Glue your flowers to the centre of your bow and if you like at this point, you can glue a few extra embellishments to the wreath, such as a couple of extra leaves around the flowers or tuck in some baby breath or similar small florals.